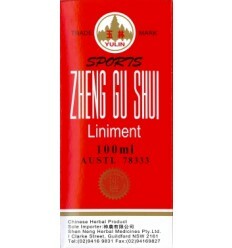 Polular liniment used for stagnation type pain associated with trauma, sprains, bone injuries and bruising. Apply topically to move stagnant blood, stop pain and promote healing. May be rubbed into the affected area or applied to cotton wool and bandaged to the site of pain for 1-2 hours at a time.